McIntyre was the factory manager at Kiblinger and bought the company out when it was faced with a company-ending patent infringement lawsuit. He changed the name of the company and the design of the car – at least enough so that the lawyers went away. But it was still, like the Kiblinger, a high-wheeler – a car with big solid-state wagon wheels and enough ground clearance to function in even the most remote sections of the new automobile marketplace. 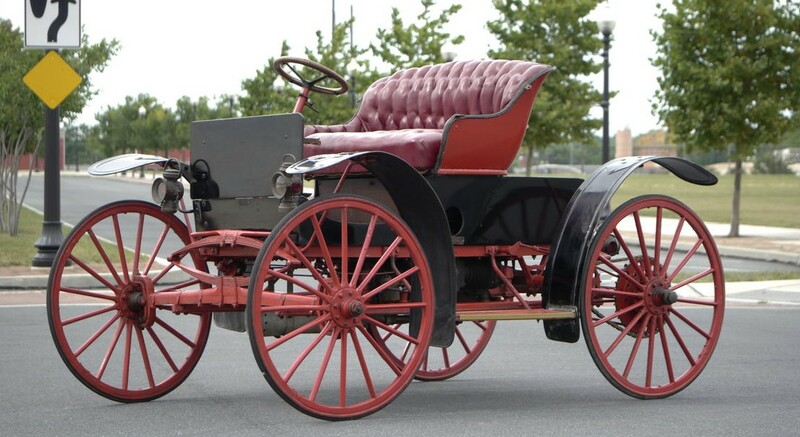 This car has a 14 horsepower flat-twin and a two-speed transmission with chain drive. 1910 was the last year for high-wheelers from McIntyre, although the company soldiered on through 1915. This one is expected to sell for between $20,000-$30,000. For more information, click here. And for more from Bonhams at the Simeone Foundation, click here. This entry was posted in Uncategorized and tagged 1910, auctions, Bonhams, cars, classic, classic cars, high-wheeler, mcintyre, model b-1, runabout by classiccarweekly. Bookmark the permalink.